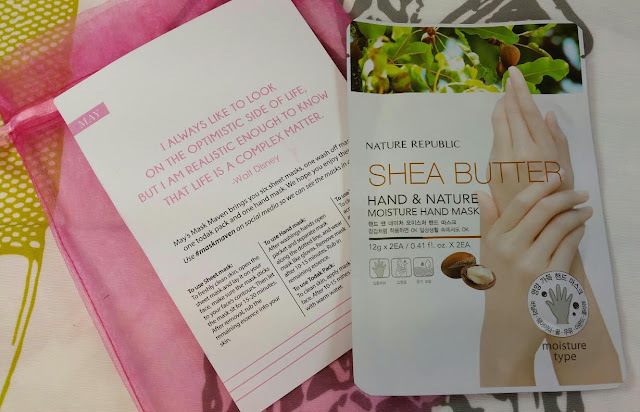 Nature Republic Moisturizing Hand Mask- I confess. I love Nature Republic because of their Lemon Foot Peeling Masks. They're the best. So I'm hoping this moisturizing hand mask is just as good. It's got very lovely moisturizing ingredients like shea butter, glycerin, mineral oil, sodium hyaluronate, not to mention a plethora of antioxidants, vitamin E, honey, etc etc. If I didn't have to type, I'd rip this open right now and put them on. Maybe I will anyway. 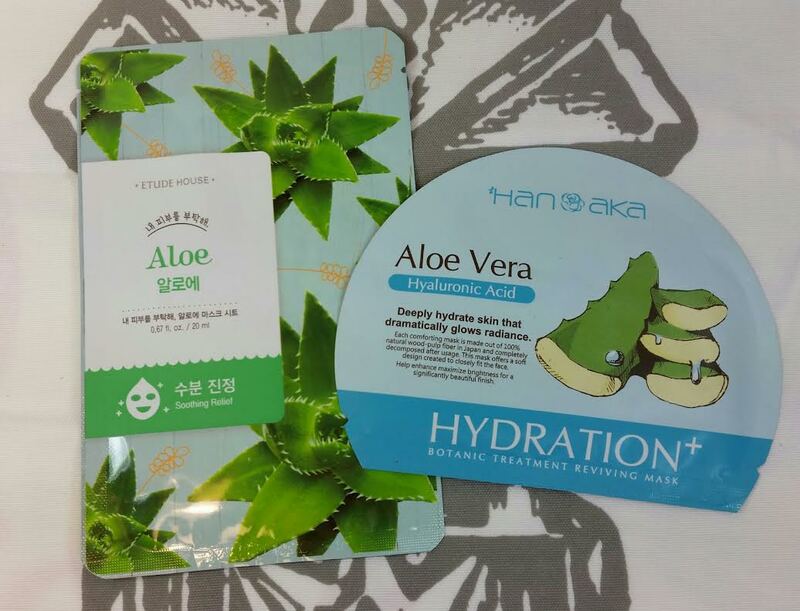 Hanaka Aloe Vera Hyaluronic Acid Sheet Mask-This is a Taiwanese brand (like My Beauty Diary). It's a moisturizing mask with niacinamide which will help with evening out your skin pigmentation. It's actually got very little aloe in it and even less hyaluronic acid so I'm not sure why they market it as such. You'd think they'd call it whitening or something. But the ingredients are decent and there's no alcohol and those are my requirements. Yay! Etude House Aloe Soothing Relief Sheet Mask- This mask has aloe and green tea extracts in it. It also has alcohol which is a bummer for me. I'm SO glad there are English ingredient lists on these products. It really makes me happy to see that. 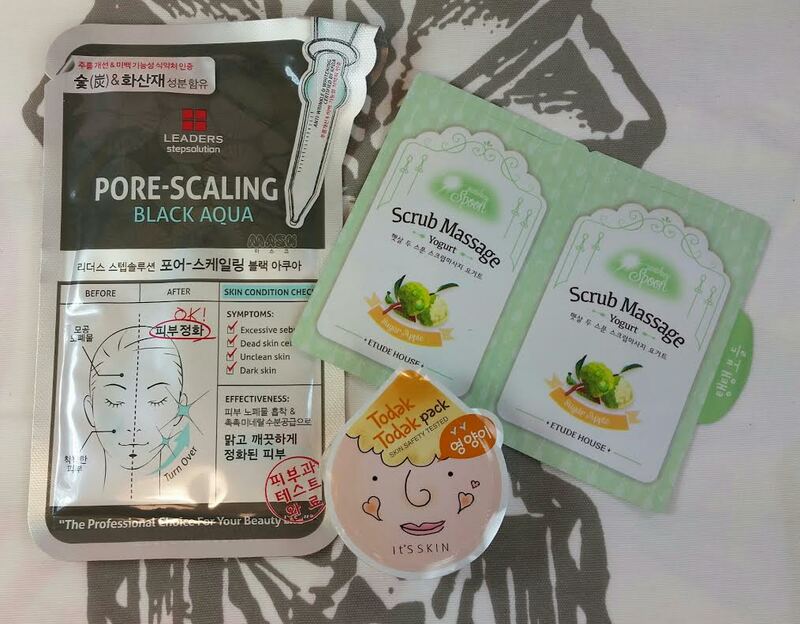 Leaders StepSolution Pore Scaling Black Aqua Sheet Mask- This mask is black and since it has volcanic ash and charcoal in it, it makes sense. If you used a white one with ingredients like that, it'd go a gross dingy grey. So, black it is! This professes to get rid of your excess sebum, dead skin cells and will even out your pigmentation problems. I freaking love charcoal in just about anything. I don't know why but my skin and charcoal is like a love match. Etude House Scrub Massage Yogurt in Sugar Apple- This is a wash-off facial scrub that you apply to your skin, massage for a few minutes and then wash off. It actually does have yogurt in it! Along with some antioxidants in the form of flower extracts. I'm not sure what the scrubbies are made of but it's not walnuts. Whew! So it's going to be pretty gentle. Walnuts seem to be killer for me. It's Skin Todak Todak Pack in Honey- I'm really sad because this got crunched in transit. I'm sure it's fine but I'm reluctant to use it. It smells UNBELIEVABLY good. Honey. I love honey in my skincare. I know they'd replace it for me if I asked (and I would if this wasn't a review bag), they've done it before without any issues. 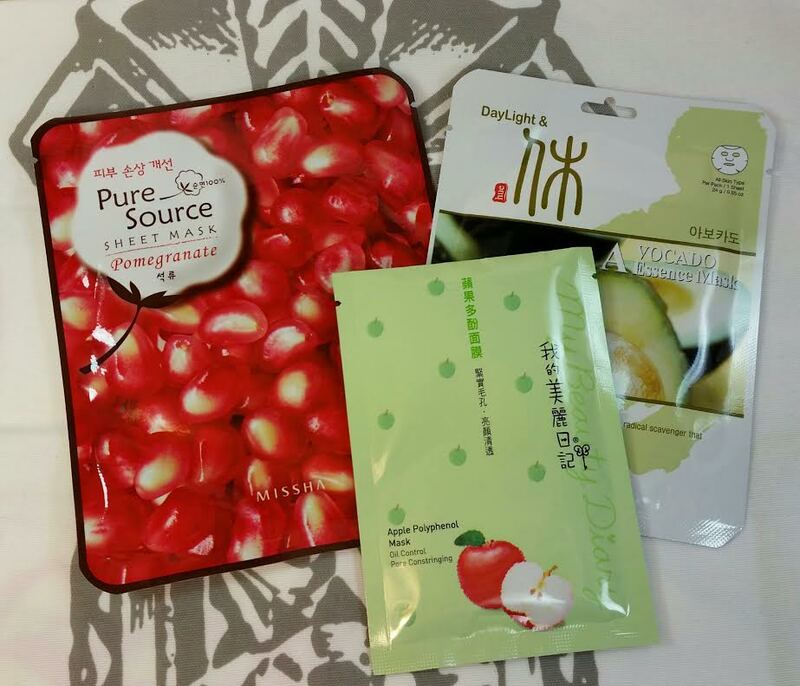 Missha Pure Source Pomegranate Sheet Mask- If you want to talk about respectable brands, I'm gonna say Missha is right up there. So I'm disappointed to see alcohol in this mask. Still there's glycerin, pomegranate extract, sodium hyaluronate and vitamin E in it, too. Hm. Decisions! I know not everyone has issues with alcohol but I struggle with red skin and I've found that alcohol just exacerbates it so I try to stay away. Sometimes, though, the benefits of the other ingredients win me over. My Beauty Diary Apple Polyphenol Sheet Mask- If you want an effective, ridiculously affordable sheet mask, MBD is one of the best. You can get a 10 pack for $13 usually. Just look at the ingredients and find the ones you like the best in a mask and stock up. They've got lots of juice, though, so if you're not a fan of juicy masks... I personally am because I like to use the drippage to get my neck and decolletage. It's not just your face that ages! Seriously. My neck betrayed me first, before the skin of my face did. The weird thing is that I'm pretty sure I'm still 26. I don't know where this 38th birthday nonsense is coming from. Oh right... the mask. This is antioxidant packed and with glycerin and aloe being in the top five ingredients, you're looking at a soothing, moisturizing mask perfect for those with troubled or acne prone skin. Humanpia Costech Avocado Essence Mask- This is a Japanese brand and while the ingredients aren't shocking, they're very reasonable and there's only a few of them. This is essentially a moisturizing mask and I would suggest it if you're feeling very dry or as a soothing mask after a day in the sun and you don't have any aloe masks handy. VERDICT: This Mask Maven has a really nice selection of brands and styles of masks. I think they are somewhat random so not everyone will receive exactly what I did. I like the fact that there are English ingredient lists on most of these. I love seeing Leaders and Nature Republic. I feel this is a fun subscription for mask lovers or for someone new to kbeauty who is trying to build up a mask stash. It's also a great way to try a whole bunch of brands, figure out what you like and then you can go buy a whole box of your favorites for cheap. I would like to see better packaging, though. If you'd like to sign up for Mask Maven, you can do that here. Make sure to use code BITSANDBOXES10 and get 10% off any length subscription! (That's actually the best coupon I've seen from Beauteque for their bags). *This box was sent to me for review purposes. All opinions are splendiferously mine. I just got my Snail Bee Essence that you recommended from Amazon today- can't wait to try it! 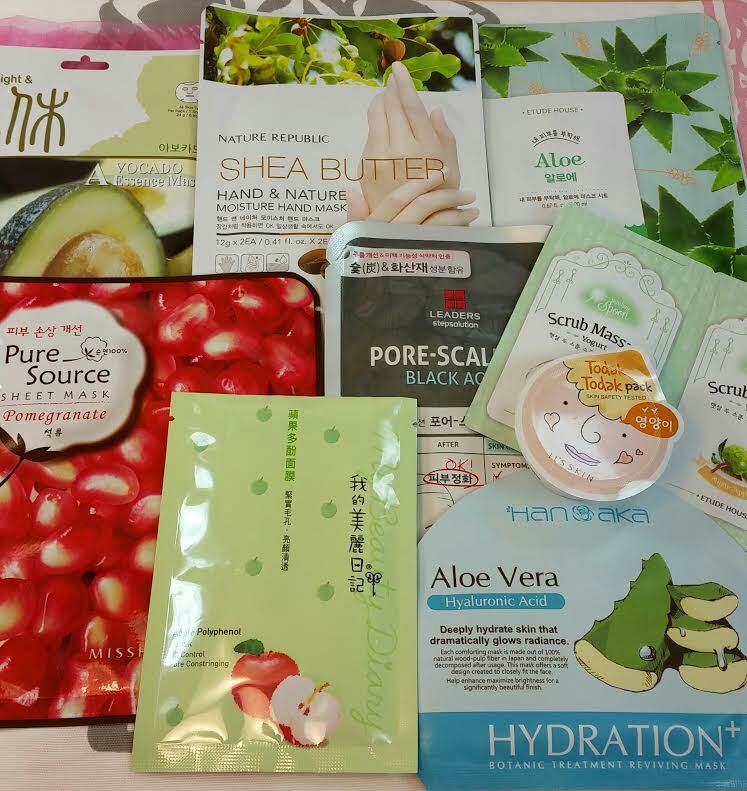 I haven't tried many masks since I was a teenager ("they" tell me I'm 38 also but I don't believe it) and I really want to try some of these masks! I might just have to add another sub to my list... I have received a couple masks in sub boxes in the last month and they both seem good: Ren Glycol Lactic Radiance Renewal Mask and Marcell Clay Mask, but maybe they seem goid because I never use masks. Would love to know your favorite! Oo, I hope you love it! Sheet masks are good for relaxing nights in in front of the computer or reading a book. My favorite is expensive (well, $5 ea which to me is expensive) but absolutely worth every single penny. It's Tahpre, which is a Korean brand but you can buy them on Amazon. There's two kinds, Everyday (moisturizing) and Special Care (anti-agingly delicious). Both are excellent. The ingredients... /swoon. A lot of masks you can't even tell you used one the next day but these two? Oh yes. You can tell for like three days. I prefer sheet masks because there's no washing up necessary. Just take the mask off and toss it in the trash. Done!